Jones Orchard is just a nice drive into the country since they put Highway 385 into place. We, my daughter and I, had dragged her son along that afternoon to pick peaches with us. Elijah is a child of video games and books and the occasional jigsaw puzzle. He wondered, as I would have at his age, why we were going to pick peaches when we could have bought some at the store and been back home in less than 30 minutes. We prepared admirably for the excursion: insect repellent, gardening gloves, a large Thermos full of ice water and plastic cups. Rachel slathered Elijah with sunscreen and I brought along a long-sleeved shirt just in case I was overwhelmed by sun, insects, peach fuzz or the outside chance of a cooling breeze. What ensued was a memory in the making, the stuff of family folklore. We had picked the hottest day of the season so far, and had gone out in the hottest part of the day. The Thermos had overturned en route and all our ice water was in the floor of my car. And somehow we’d managed to pick twice as many peaches as we could afford to take home. The guy in charge agreed to keep the ones we didn’t want. It seemed like he was getting a great deal. They were the prettiest peaches we could find among 50 trees. We brought home 30 pounds of peaches. We’d eaten many, given away many more. Now we were down to the last bowlful, past their peak and facing a moldy demise without prompt attention. During a summer of feast and famine we were solidly in the famine part. Pennies were scarce in the household, dollars even scarcer. We had slowly, slowly stopped treating ourselves to fountain Cokes and frozen custard. We were trying to satisfy those cravings with PB&J and cereal. The pantry was full of odds and ends that seemed mostly unrelated. There was a Mason jar with a handful of old-fashioned oats, not enough for a decent bowl of oatmeal. Some freakish sense of frugality had ensured the survival of a tablespoonful of butter-flavored Crisco. It was flanked by half a pound of flour, some sugar and some pancake mix. While looking through the freezer for hope one hungry afternoon, I noticed a bag I’d stashed the summer before. It was a quart of wild blackberries. Before moving in with my daughter, I lived near the University in a sweet old neighborhood. During work breaks I’d walk to school and back to stretch my legs. I was keeping an eye on a clump of wild blackberry bushes growing at the edge of a campus parking lot. One day when the mood was right I drove over to see them. I stepped into the blistering sun wearing a dress shirt, jeans, tennis shoes and a baseball cap. I ignored the stares of passersby and picked as fast as I could, dark berries that bruised easily and bled purple onto my gloves. By the time I was dizzy from the heat I had a pailful, which I washed and promptly froze, forgetting all about them. And here they were, remembered on a day when I needed to remember them. Cobbler takes hardly anything at all to be a wonderful dessert. And we had plenty of hardly anything at all. 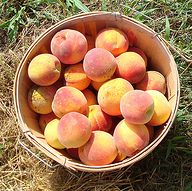 But we also had hand-picked peaches, just waiting in the bowl, and wild blackberries. In our refrigerator, amid two dozen jars of pickled and preserved things, I spotted a lonely pat of real butter. And we had milk. Thank God, we still had milk, for cereal and for coffee and today, for cobbler. I set a pot of water to boiling so I could blanch the peaches, and filled the sink with ice water. I examined each peach for doubt. I melted the Crisco with the butter, and poured it over the oats. I tossed in enough flour to make a pea-sized meal. I padded this out with pancake mix and stirred in milk until I had a nice-sized ball of dough. Flattened out between two sheets of waxed paper it yielded a generous top crust. I diced up the fresh peaches and sprinkled them with sugar, then added the frozen berries and added sugar to them as well. Something reminded me to throw in a little flour for thickening. This pile of fruit, shiny with its own syrup, completely filled my old Corning casserole. The crust went on and curled up on the sides, almost running over the edge. It seemed like a celebration sliding that cobbler into a hot oven. I reasoned that no matter what I did, I couldn’t have messed up such spontaneous bounty. And cobbler is very forgiving, as long as you add enough sugar and don’t let the thing burn. And so we were forgiven. The crust was perfect, rustic and crunchy, the berries and peaches singing with juice and sunshine. I may never make another such perfect dessert, because I may never again be so broke and bent toward improvisation. But I hope I remember that I was able to find everything I needed and more — it was all right there for the taking.